This is the first book ever written for adults with hip dysplasia. I started it in November 2009, just after my total hip replacement, and was joined by my co-author Dr Sophie West, soon thereafter. Like me, Sophie has bilateral hip dysplasia, and is in the unique position of being both an orthopaedic surgeon who does hip surgery, and a patient who has had two periacetabular osteotomies! It's taken two years of writing, months of editing, reviews by three dedicated editors, and about two months of very hard slog for me in doing all the layout, design, illustrations, editing changes, and proofreading, not to mention registering my business Sutherland Studios as a publisher, obtaining the ISBNs (paperback and hardcover), and getting the CIP Data entry from the National Library. 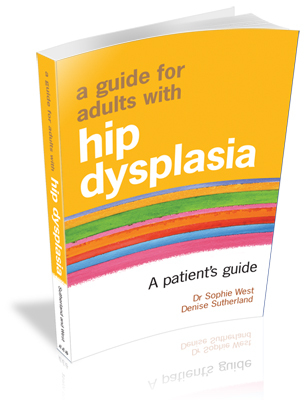 A Guide for Adults with Hip Dysplasia is 456 pages long, has over 50 illustrations and x-rays, and over 400 quotations from 50 real live adults and teens with hip dyplasia. We are self-publishing via the print-on-demand giant, Lulu.com. We did approach medical publishers, but they deemed the book "too niche market" ... what, something that has roughly the same incidence as multiple sclerosis? How many patient guides are there for MS? And none for adults with dysplasia?! You can read more about the book here, the table of contents is here, and it can be ordered here! I am SO excited for you! Yayyy!!! Oh, that's fabulous. Pshaw to the medical publishers, I wish you fantastic sales!! Tori, our first Labrador, had hip displaysia. Congratulations! What a lot of work! Hope it is a great success! What a star you are. Excellent idea. Will be very interested to hear how the print on demand goes. Congratulations! Another baby out in the world! Whoot - congratulations! Major accomplishment. Sharing your knowledge and tips with others about a serious health condition is to be highly commended. Great product shot, too - very dynamic! While Lulu has all the signs of being a vanity publisher, with the subject matter of the book, it seems inappropriate to call it that. Congrats on another job well done.